Psychologists and doctors have offered perspective on the mental aspects of CrossFit, so original firebreather Greg Amundson delivers a CrossFit coach’s guide to goal setting, self-talk and an indomitable spirit. Greatly influenced by this remark, I set out to become a student of the mental aspects of CrossFit. Through observation, practice and research, I discovered something remarkable: the world’s best CrossFit athletes had learned to control and optimize their self-talk. This potent mental skill resulted in their ability to formulate and achieve their goals—both inside the gym and out—with consistency and grace. 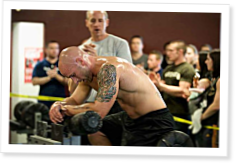 The natural extensions of their positive self-talk were optimistic energy, mental toughness and indomitable spirits evident in their physical accomplishments in the CrossFit workouts. I concluded that Coach Glassman was indeed correct: the mental adaptation to CrossFit was of critical importance to CrossFit athletes and coaches hoping to forge elite fitness. Now, nearly four years after the seed was first planted, I hope to share the key lessons learned as a result of the spark Coach Glassman set inside me. A key concept Greg Amundson teaches in the CrossFit Goal Setting Course is how to use the mind to command the body. Thank you for writing this article. I encourge my athletes throughtout the workout, but now I will be more aware of how I am structuring those comments. Thank you also for pointing out the three times an athlete is impressionable mentally. I haven't been preparing them mentally enough before the workout. On another note, it is great seeing you on the main site again crushing workouts. It always an inspiration! Fantastic article. I have been coaching gymnastics for over 10 years now, and the children are a constant reminder of the necessity of Positive reinforcement vs. Negative. You've been a positive role model in my CrossFit pursuit since the first pictures of you were posted on CrossFit.com - but you know what I really want? A follow up article from Dave Leys! Wow, thanks! I really do believe that I needed to read this today. Thanks for posting this. I will be attending CrossFit Certification this weekend in Charlottesville and I will be sure to carry this in my mind when I head out there. Very inspiring article. I never realized that saying "don't do X" gets internalized as "do X" by the subconcious. I feel that this will be a helpful article for not only my own mental toughness but also when I teach or help others. I am also inspired to plan out my goals a little better. Thanks! Your reference to the Indomitable Spirit caused me to recall a Samurai quote I once read. Having read the quote again I can see that this might have been used as positive self talk. I have had negative little thoughts come up during workouts and they are devastating. Thanks for your article. aggressive as fire and as immovable as a mountain. Hey Greg, great stuff. You're still my original Crossfit favorite. Your Tupperware Man article is helping to guide me through my own Zone Diet experiment. Good to see you still writing. I could not think of a better person to write this article. Greg A is one of the most positive people I have ever met. Awesome Greg! The negative self-talk is HUGE... I know MANY MANY CF'ers who can't seem to say anything positive about themselves or their performance. Competition is a big part of what we do..but Comparison should not be. That is a subtle but huge distinction. One that we probably don't spend enough time giving thought to, and I think it lends a lot to the negative self-talk that is sometimes audible. Well said Greg. An illustration by Lanny Bassham of this is the coach telling his little leaguer heading up to bat "just don't strike out." Guaranteeing his "mental picture" will be of him striking out. Well, from now on, I'll work on approaching myself more positively. May help me get back to where I was, then surpass it, sooner. Greg - great article, thanks. As a psychologist this was something i wanted to instill in my athletes from day one of affiliation (been affiliated now for about 2-3 months). We have an active GOALS board and an Active PR board and we celebrate everyones accomplishments. Recently we were at a competition and one of my athletes did not complete a wod. She was quite disappointed, then afterward, once she got out of negative town, we made her realized that she had just completed 29 reps of what used to be her one rep max ground to overhead. The psychological effects on here were quite amazing and she killed the next WOD. The encouragement and teh camaraderie are an amazing psychological and neurological effect. For example, we've got a lot of Eason to believe that camaraderie, by means of cheering on your athletes and teammates during a WOD increases release of natural pain killers. It's quite an amazing effect. I also like how you linked completion of the WOD with other facets of life. It's so true. If i can do a ring hand stand push-ups with out dying, well damn, my day at the office, or in the classroom looks a whole lot easier. CrossFit for me has done amazing things to transform not only my body and fitness, but my psychological well-being. My athletes as well. One of my other athletes, a late 40's something male just posted a transition picture show to s facebook. A pic of him when he used to walk on a treadmill for exercise, a pic of himself about the day before he started CrossFitting with us, and now two months or so in. There are about 10-15 comments on his post and while many of them mention the obvious change in his appearance they all also note the change in his state with comments like, "your smile seems better" Its quite amazing. Great article. As a new coach, i take a lot from these articles so it's was very useful to me. As a parent of a 15-year old son that's starting a home workout program with me next week in order to prepare him for soccer next Spring, I am greatly appreciative of this article. I will definitely focus on the positive to keep him motivated and working hard, as well as set goals that will challenge him, but build confidence when they're achieved. Put me down for one "Forging an Indomnitable Spirit" t-shirt! One of the best articles in the Journal to date.